Here's what investors need to watch going into Main Street Capital's earnings release. Main Street Capital Corporation (NYSE:MAIN) will report earnings on February 27, and all eyes are on this top-performing business development company. Main Street Capital is a rising star, delivering impressive capital gains and dividends to investors since its IPO in 2007. Investors who bought in at IPO have enjoyed a total return (dividends reinvested) in excess of 300%. Let's take a look at some of the most important things to watch when Main Street Capital reports earnings. We'll start with the ugly -- losing investments. Main Street Capital reported in its fourth quarter update that it moved two investments to nonaccrual status, reflecting the potential that Main Street Capital may take a permanent loss on these two items. Luckily, the company also noted that these losers won't have outsized impact on the company's balance sheet. And while two investments will get a write down, a prior non-accrual will go back to accrual. I'm eager to see which investments these are, and the size of the investments on the balance sheet. 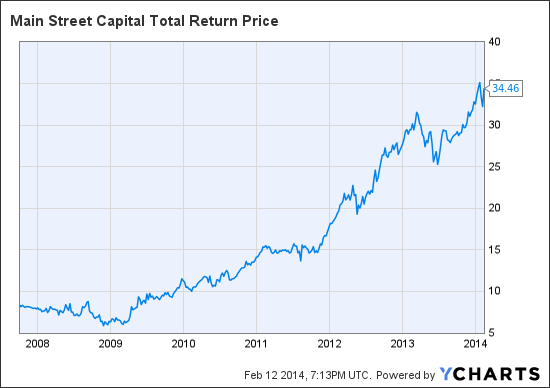 Main Street Capital pays a monthly dividend, with two supplemental dividends paid each year. Combined with the $0.50 in supplemental dividends, the company expects to pay out more than $2.50 in dividends in 2014, exceeding the $2.48 dividend rate paid in 2013. This is, in my view, a promising sign. Main Street Capital could simply increase its supplemental dividends, but the increase will come in the form of a monthly dividend increase. That suggests optimism surrounding its ability to pay a bigger, routine dividend. Main Street Capital raises funds with secondary offerings, which typically lead to a quick, 4%-5% decline in share price as new shares hit the market. I'm interested to hear something about capital-raising plans in the conference call. The company currently trades at about 1.7 times book value, so raising new capital adds significantly to existing shareholders' wealth. However, new shares dilute the value of the company's low-cost funding from the Small Business Administration, as it is already making full use of the SBA lending program. New debt capital will be more expensive than the subsidized rate Main Street gets from Uncle Sam, so Main Street is at a crossroads -- it's go big, or go home. The lower middle market is the company's niche, where it earns more than 14% on debt investments in small, American businesses. Last quarter, yields fell from 15.4% to 14.9%, a trend that demands careful scrutiny. Many BDCs have reported declining yields on debt investments -- we'll want to see yield compression slow in the fourth quarter. Remember, Main Street earns only 8.9% on debt investments in larger middle-market investments, some six percentage points less than its returns in the lower middle market. Main Street Capital's outperformance comes from quality underwriting and above-average debt yields. This quarter, investors will want to see that the "special sauce" is still in play at this top-performing BDC. In particular, I'll pay special attention to Main Street Capital's plan to reverse its two new underperforming investments, and any impact it may have on earnings going forward.